Eugenius E. Mitchem(n) of Morgan County, Georgia served in Company D of the 24th Battalion, Georgia Cavalry. On February 13, 1864 the 7th Regiment, Georgia Cavalry was created through consolidation of three units, the Hardwick Mounted Rifles, 21st Battalion, Georgia Cavalry and 24th Battalion, Georgia Cavalry. At this time E.E. Mitchem was assigned to Company I of the 7th. Pvt. Mitchem was captured June 11, 1864 at the Battle of Trevillian Station, Va. He was sent to Fortress Monroe on June 20th and on July 25, 1864 was transferred to Elmira Prison, NY. He died on May 7, 1865 of Variola (small pox). 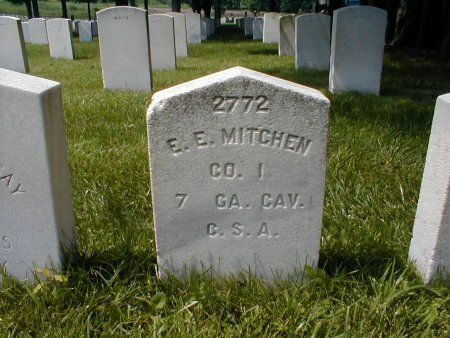 Eugenius E. Mitchem(n) was buried May 8th at Elmira in grave # 2772.